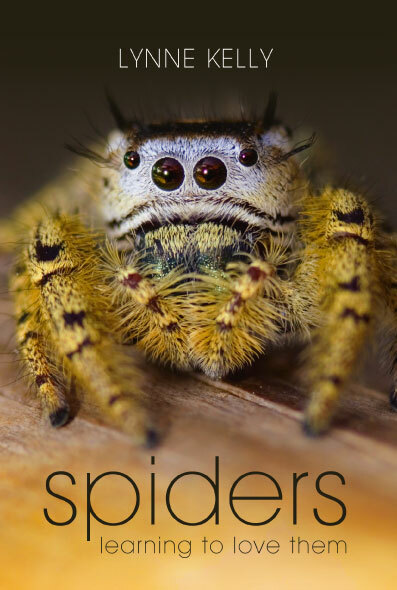 I am currently reading your book on spiders. It is truly one of the most exciting books I have ever read. Like you, I suffered from arachnophobia for many years, until one day, at the age of about 30, when I decided that it was too ridiculous and I started to observe the spiders instead. I started with watching a 45 minute film on our newly acquired colour television. I sat right in front of the screen with my heart pounding for the whole time. It did work, now it was easier for me to go up to a small spider and just look at it. Anyway, it went from there to being totally fascinated by the beautiful creatures. Just like you I have given some of my spiders names. I had one in the kitchen when I first met my husband. He saw this black thing in the top corner of the kitchen and asked if I knew I had a spider there. I said yes, that is Herbert and he lives there. This was before I knew that it probably was a female. My husband to be was not too pleased and asked a few times is Herbert had to live with us and I told him "Love me and love my spider, Herbert stays". (After 28 years I am still married to the same man). My "mission" in life is now to teach my grandchildren not to be afraid of spiders. It seems to be working, just a bit. Two of my granddaughters of 14 years of age have actually sent me photos of spiders. I have a friend who is rather afraid of spiders. She actually went with me to a large exhibition of live spiders in Copenhagen a couple of years ago and it has changed her attitude towards spiders. Her granddaughter sees a spider and asks her grandmother "Should you not take a picture of it and send it to Ulla?" Even by husband is now able to see a spider without calling me to remove it. He even puts up with me reading aloud from your book at night in bed. 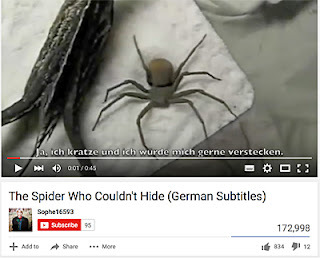 I have been looking on YouTube at videos about spiders. One thing that really annoys me is that although they seem to want to teach you not to be afraid of spiders, they still present them with horror-film music and dramatic voices like this is something to be afraid of. 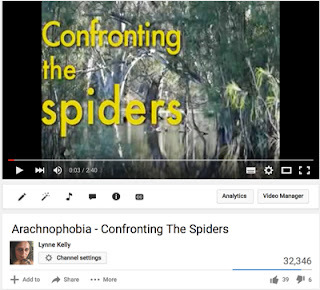 Here is a link to my video on recovering from arachnophobia. It has been viewed over 32,000 times so hopefully it may have affected someone positively. Ulla asks about good videos about spiders - I'd love to know more and add them to this blog. Please send me suggestions! 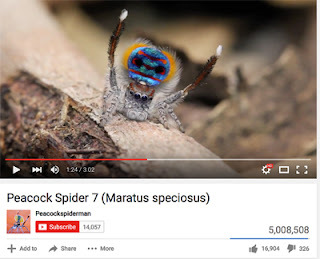 Do you know of any documentaries about spiders where they present the animal in a normal way, with love and admiration? I don't suppose I'd ever get to Australia, but if I did, I would love to see your forest of white cutlery. Anyway, forgive my ramblings. I just felt the urge to share my little story and to tell you how much your book means to me, and as I said, if you know of any good videos of spiders, I'd love to know. This is very interesting. I am glad that some can get over their phobia about spiders, assuming the above descriptions could be classified as real phobias. If they are, then these descriptions seem supportive of a therapy i hear about regarding phobias, which is that one can reduce the fear by toughing it out during deliberate exposure. The fear rises, but like a bell curve it will subside after a time (a couple minutes, I think). This bell curve will happen again after each exposure, but by repeating it its power becomes less and less. Thank you for the comment, Marconi. I was too scared of therapists exposing me to spiders and expecting me to touch them, so I did it my way. The exposure was very safe - tiny spiders on the other side of the window - and slow, so my bell curve was gentle. I took six months of daily exposure before I watched an orb weaver make her web and was enthralled. But it was still much longer before I held a spider. The secret was knowledge. I overcame my irrational fear and converted it to an irrational obsession! Much happier this way! So glad to hear from another friend of spiders - they need as many friends as they can get!